When you were a student, did you ever have a nightmare that the final test for some class was that day, and you hadn’t studied for it? Yeah, me too. Friends who are actors have told me about a similar bad dream that is common to their profession: they are about to go on stage and don’t know any of their lines. 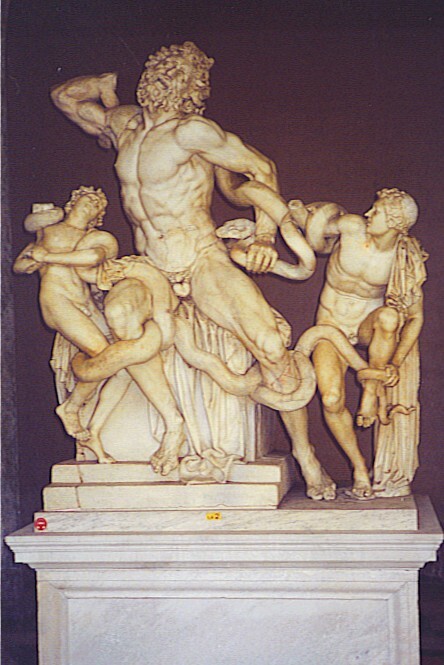 Any one of those is bad enough, but consider the multiple nightmares of the famous sculpture known as The Laocoön Group. The central figure is a guy named Laocoön (pronounced Lay-AWK-oh-on), who, according to legend, was a Trojan priest. He had already annoyed the gods with some misdeed, but then he suppposedly warned Troy against taking in that wooden horse left on the doorstep by the Greeks. For that he was punished by either Apollo or Poseidon, depending on whose version of the story you accept. Even a brief glance at this large marble sculpture makes clear what form the punishment took, and what constitutes the most obvious nightmare: Laocoön and his sons were crushed by two giant sea serpents. Yikes! The sculpture group is attributed to three collaborators from the Greek island of Rhodes — Agesander, Polydorus and Athenodorus. Most scholars date it to the first century B.C., but about a hundred years later it showed up in Pliny the Elder’s inventory of stuff at the palace of the Roman emperor Titus. How did it get from Rhodes to Rome? That’s unknown, but that was Laocoön nightmare #2: “Huh? Where am I? How did I get here?” And then… he disappeared until 1506, when the sculpture group was dug up in a vineyard, where it had apparently been buried for many centuries. Tell me that’s not a nightmare. Soon thereafter, the sculpture group was relocated to the Vatican; Laocoön and sons now find themselves naked in church — nightmare! When they were discovered, each of the figures was missing arms or hands, and over the centuries since 1506, various artists have attached replacement parts (they’re-experimenting-with-me nightmare). After his conquest of Italy in 1799, Napoleon had The Laocoön Group carted off to Paris (that could be the nightmare about being chased or attacked). The British removed it from the Louvre in 1816 and returned it to the Vatican. This entry was posted in Art and tagged Laocoon, Michelangelo, nightmares. Bookmark the permalink. Yes, it is a nightmare, but it is also one of my favorite sculpture. And from your blog, I know that you have seen a lot of sculpture in many places around the world. Thanks for your comment, Victor.